race in the event of poor weather is a slim one. Things don’t look much better for Thompson, Connecticut, either. That is where PASS is scheduled to hold their second race of the season on Sunday. There’s a 70 percent chance of showers for that area. Only light rain is predicted for Barre, Vermont, where the second ACT Late Model of the year is scheduled for Thunder Road Speedbowl. The problem is that the weathermen are calling for that to be 80 percent likely. If Class Day, the traditional opening day for Thunder Road, is rained out, it will be the second time this season for that to happen. The event was originally planned for May 1st. Then again, the weather in New England is anything but predictable, so don’t rule out your weekend plans quite yet. Regardless of whether it rains, snows or is a perfect spring weekend in Epping, New Hampshire, the NEMA show at Star Speedway (NH) won’t happen on Saturday night. Exeter (NH) News-Letter as saying that he believes track management has purposely withheld from the town and state an engineering report on the structures at the track. For the past several years, the track has delayed their opening because of problems with the town when it has come to plumbing, structural and fire code issues. Track owner Bob Webber and his attorneys have said in the past that these problems have been a result of minor maintenance issues. The track’s website shows no updates at all to the situation this year and a phone call to the facility on Friday morning only finds a recording stating that the racing program for May 7th has been cancelled and to be sure to call back on Monday (May 9th) for updates. Racing on Friday nights can be an advantage if it rains for the rest of the weekend and for that reason, the ACT Late Models were able to get their season underway last weekend at the Lee USA Speedway. Speed51.com was there to see a wreck-filled 100 lapper with Cris Michaud taking the victory. For the race story, please click here. But that’s not all – for a full serving of ACT Leftovers, please click here. There was some open-wheeled action in the Northeast last weekend as well. The SK Mods ran at Stafford on Friday night and Jeff Baral was the man to beat. He put his #18 car into victory lane over a pair of Modified Tour drivers – Ted Christopher and Eric Berndt. Further back in the pack were Tour competitors Jeff Malave (7th) and Doug Coby (11th). Last weekend was another sour one when it came to racing weather in the Northeast and this coming one might not be much better. Last weekend, the IBG PASS Pro Stocks were washed out for the second week in a row at Oxford Plains Speedway (ME). Without much luck in the spring, track and series officials have now moved the race to Sunday, July 3rd, when it will be called the Firecracker 150. The move sets up the race as a primer to the July 31st Banknorth Oxford 250 and it might be interesting to see how many teams use the 150 lapper as a test session of sorts for the biggest Pro Stock race of the year in New England. Also rained out last weekend was a 105-lap open Pro Stock event at Unity Raceway (ME) and the weekly shows at many area tracks including Beech Ridge Motor Speedway (ME), Waterford Speedbowl (CT) and Seekonk Speedway (MA). Fans might not be able to get much of a racing fix in New England this weekend either. Tour officials pulled the plug on their appearance midweek after it was uncertain whether Town and State officials would be granting track management the necessary permits to open up for the season. The track was originally scheduled to start their year on April 16th, but has been denied the ability to do so by authorities. But it won’t be Kurt this season at Oxford. Instead, his younger brother Kyle, the rookie driver of Hendrick Motorsports’ #5 car, will enter the event. Busch will be a teammate to Mike Rowe in a car fielded by SP2 Motorsports. Having Rowe as a teammate and coach might be a secret weapon for the young gun. Rowe is the all time feature winner at Oxford Plains Speedway. The NEMA Midgets won't be at Star this weekend and from the looks of things, theremight not be any activity at the track for awhile. Donny Lia did not take the green flag after a hard turn-one wreck in practice destroyed the #47 Wisk/Clorox car that he was driving. Lia took a trip to the hospital, but checked out OK. The car wasn’t so lucky – it was destroyed. However, the #47 team was hard at work this week prepping a new car for Stafford and will be back in competition this week. Mountain Speedway (PA) got their features underway Friday night with Rusty Smith taking the checkered flag over Brian Defebo. Occasional Tour Mod drivers Jim Long and Dave Pecko finished third and fourth respectively and NASCAR Busch North driver Don Wagner finished fifth. Over at Mahoning Valley Speedway (PA), ZZ topped the field. The winner in the Modifieds there was Zane Zeiner. There were a few drivers with Mod Tour ties there as well. 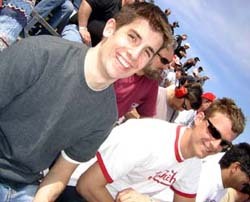 Tyler Haydt, the rookie driver of the King Racing #28 on the Tour, was fifth and Matt Hirschman, son and sometimes co-crew chief for his championship winning father Tony, was ninth. Last season, the Banknorth Oxford 250 at Oxford Plains Speedway (ME) boasted two NASCAR Nextel Cup drivers. Kurt Busch and Matt Kenseth both came north for the race. Kenseth has announced his return to the Whorff Motorsports stable for this season’s race and this week, it also became official that there will be a Busch in the house as well. AVERY’S DAYS MIGHT BE NUMBERED? David Avery had a lot to be happy for entering the off season this winter. He finished second in the season ending ACT Late Model race last season at Thunder Road Speedbowl. The best finish of his career didn’t happen in just any race either; it was in the prestigious Milk Bowl. 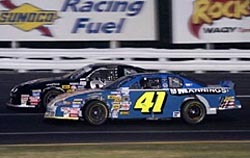 Avery backed that up with another second-place run to start 2005. He finished as the runner up to Cris Michaud last week at Lee USA Speedway. You would think that this would be a good boost to his confidence and career. But that might only be half true. Avery’s family owns White Mountain Motorsports Park, a tidy little quarter-mile oval in New Hampshire that hosts both ACT and PASS races. Although 2005 might be his last year in a car, Avery isn’t throwing in the towel yet. A victory is big on his to-do list for the season. “I’d really like to try going out on top,” Avery said. The #41 Busch North team has made a few changes for their 2005 campaign. The team will beef things up this year by running Don Wagner for Rookie of the Year honors in the series. The James Pritchard-owned entry will be at somewhat of a disadvantage without running the full schedule, however. Their first race will be June 12th at Thompson Speedway (CT) and the team hopes to enter as many events as possible. Former Busch North and current ACT Late Model driver Mark Durgin has also joined the team as crew chief and Snacketizers, a New Jersey-based brand of beef jerky, has joined the team as an associate sponsor.